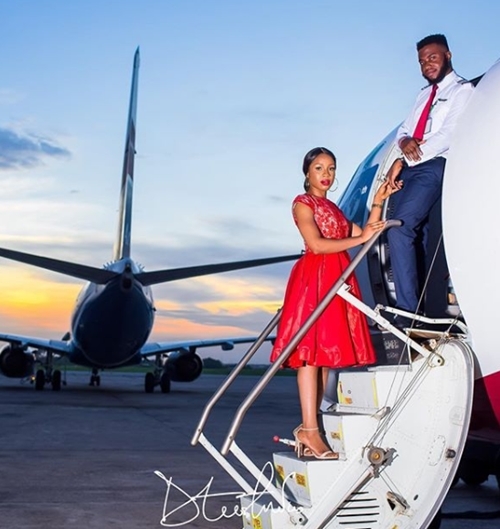 Nigerian couples are gradually taking the idea of pre-wedding photo shoots to a whole new level and this is clearly reflected in the photos of this adorable couple whose love story has inspired people on social media. 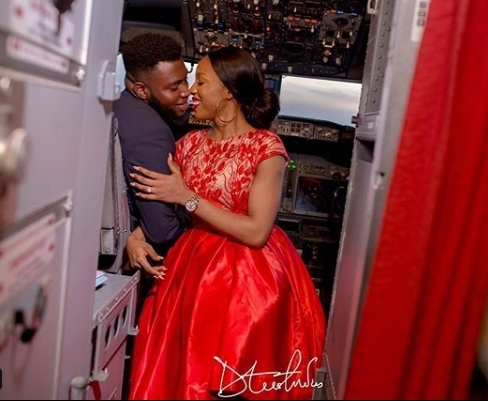 A Nigerian lady identified as Mrs Reen Udeze, has taken to her social media platform, Instagram, @diary_of_a_pilot_wife, to share some lovely pictures from their stunning pre-wedding photo shoot and had nothing but good words and accolades for her hubby. 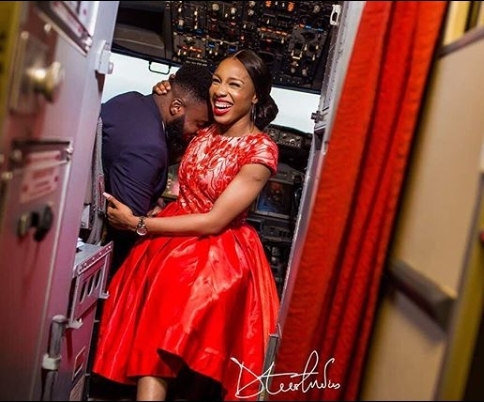 She used the opportunity to talk about her husband's focus and attentiveness and the real reasons why she chose to marry her pilot lover. 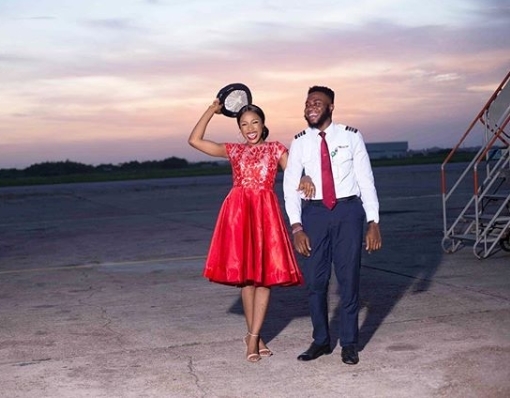 "Why I Chose Mr Pilot"
As difficult as it is to convince some people that it wasn’t just an attraction and it wasn’t just a meet today and fall in love thing, I’ll stand firm to say, I chose Him for reasons I’ll be sharing. God’s will: I didn’t marry just who I love, I married the will of God. As difficult as it is to put it across to you and to convince, I wouldn’t have said Yes if it wasn’t the will of God (I’ll one day talk about how I knew it’s God’s will). He misses me and shows it: He knows it that long stint of radio silence wasn’t good for me and he made sure he showed he miss me, I had a phone where I had 360 of his messages; when he was busy, he dropped messages and when we see, he hugs me and means it. He appreciates me: I know how easy it is to see the things that haven’t been done than the ones that have, not for Him!. He appreciates and says thank you for the ones I couldn’t do. He supports my dreams: As big as my thoughts are, he supports me and thinks along with me. He tries to find out the deep passions of my heart and is always willing to talk about how to get there and willing to help me because he knows better that when I’m fulfilled, I’m a better woman and a better wife. When he’s with me, he’s with me alone: I don’t fight with his phone for attention. I’ve seen put chats on mute for me, block numbers, turn off phone, ignore even emergencies. He makes every moment we spend together count. He has eyes only for me: He began to understand that things like flirtation bring the self esteem of a woman down. He worked on himself for me. I am the only one he desires without a cloth; it makes me stronger and confident. In the process of trying not to live under God’s permissive will I met a PILOT. Truth is, I didn’t really care if it was God’s permissive will or not. I made my plans and began forcing God into accepting my plans. The very important thing I learnt during this process was not to plan and invite HIM(God) but to let him plan and invite me,no wonder Jesus was willing to say "Nevertheless, no my will but yours be done"
Being his girlfriend came with so many challenges and roles. I found out he lived his life on the go and sometimes was unavoidably away from me(even though we agreed to see every month). I just knew it would take strong commitment and a forgiving heart to get to the end of it especially when I know I was seeing a really young one that spent almost no part of his late teen age and early twenties with his parents. 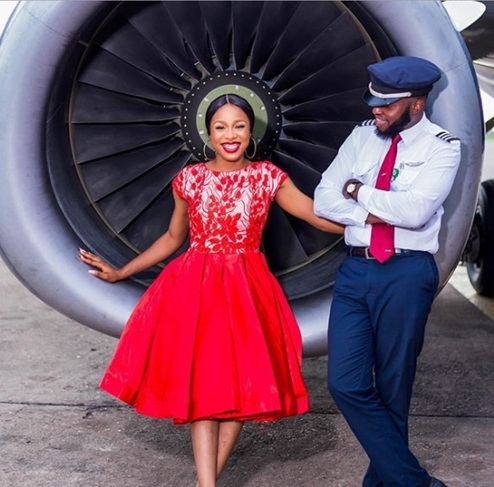 Most people who have never dated or been married to a pilot, hold an assumption that all pilots have affairs or are untrustworthy. With good-looking crewmembers, long overnights in different cities, how could they not be unfaithful? Right? The fact is that yes pilots are constantly being placed in situations that could welcome cheating, but the reality is people are disloyal in their relationships regardless of their profession, and not all pilots fall under this general stereotype. I realised I had to be a certain type of person, I must know how to go often on my knees, I must know how to learn to be alone, I must like to travel, I must have less trust issues and be a very confident woman. We had alot of fights, not necessarily because he was was wrong, but because it was my first Travel Person experience. I then realised I needed to introduce somethings, I needed to do better, I couldn’t have just happy moments, I needed to focus more on positivity. 1. PRAYER: I found a confidant in God, I was willing to share my fears, the girl I felt was a threat, the beautiful hostess I think liked him, his journey and most times I couldn’t pray, I lay and meditate and let the Holyspirit pray. 2. COMMUNICATION: I realized he spends more time travelling and sometimes, it creates communication challenges as he’s even behind schedule and during flights, he can’t be reached, he lands, I can’t talk to him sometimes because of different time zone. Lack of communication can cause insecurities or questions of what’s going on while on trips, it can also lead to relationships that don't require regular check in and that doesn’t hold him accountable for his actions. I began regular checks and he got so used to it. He began calling often to let me know he landed safely, video calls became often too so I’m included in his plans, see how healthy he’s eating and talk him to sleep. In doing these, I built a healthy foundation to deal with distance . 3. FLEXIBILITY: My first year with him was the very first time I celebrated my birthday away from my real friends and family. I began to adjust my life around his schedule; I was ready for impromptu weekend getaways and little sacrifices of "can’t make it this week babes,I’ll love you to come"
4. GOOD TEAM: I have the most amazing friend, sister and parents ever, they knew I wasn't gonna be available often. They were always willing to pack bags for travel. 5. HOBBY: I saw myself living just for him, and God of course so I began my violin classes again; so when he was away and I can’t talk to him, I just play. 6. CURIOSITY ABOUT HIS JOB: I began to expand my knowledge about his job and office. I read, I asked questions, I talked to his friends so when conversations came up, I had input in them. 7. CONFIDENCE: I got to realise he was used to getting whatever he wanted as long as he mentioned he was a pilot. My confidence level increased, I made him understand he had to work extra for me and I knew my worth. 8. RIVETING: I was a riveting person, I came to understand that he already had so much busy and boring time at work and being with me needed to give him a different form of exciting feeling to always look up to. I was crazy and willing to try out new things and was willing to switch to his kind of fun. 9. SPEECH THERAPY: I learnt to put words the best way ever, i learnt not to say,’do this’ but say ,’it would be nice if you do this.i learnt to speak less when upset.